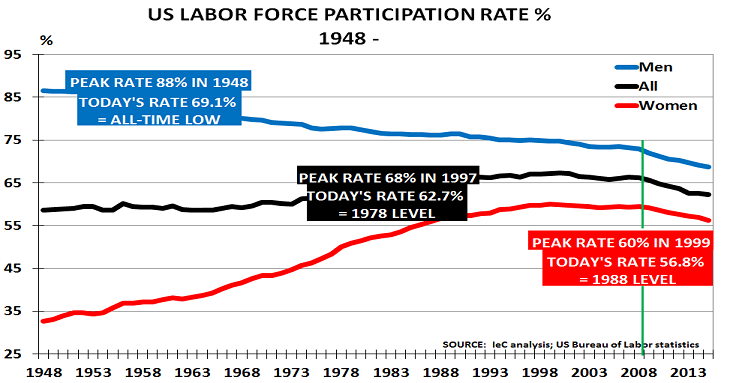 This highlights how the workforce is now missing 12m people, due to the fall in the participation rate. 173m would have been working today if the peak rate of 68.1% had been maintained. Instead, only 161m were working. Inevitably, therefore, US GDP continues to disappoint. Yet policymakers ignore this critical fact. Instead, they pretend that monetary policy can somehow fill the gap created by these missing 12m people. It would be nice if true, but common sense tells us this is wishful thinking. 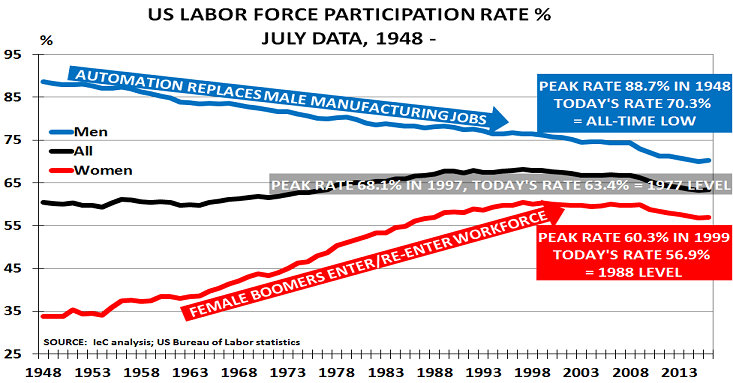 □ This growth in female employment also helped to counter-balance the ongoing loss of higher-paying, mostly male, jobs in manufacturing, which were being steadily replaced by technology. More than a quarter of US employees worked in manufacturing in 1970, but this percentage had fallen to only one in ten by 2010. These are not difficult trends to reverse, if policymakers were willing to do this. They would, however, involve initially difficult conversations with voters – which is why neither Presidential candidate are likely to raise the key issues. The US is not like Japan, where the population is now actually falling. Instead, its population has been growing quite strongly. There were 267.8m people in July 1997 when the total participation rate peaked, compared to 324m in July. These problems won’t go away just because policymakers choose to ignore them. They will simply get worse, and make it even harder to reach an agreed solution. Historians will not be kind when they come to discuss this failure. Equally worrying is that there is no sign of any improvement. If we look at data for the month of May, it shows that overall and female participation has been in steady decline since 2008, when they were 66% and 59% respectively. Every single year since then has seen a decline. Male participation has seen almost exactly the same trend, with the exception of last year – when it rose by 0.3% to 69.5%. This year, however, it fell to a new low. The striking thing about the post-2008 downturn is that it parallels the launch of the US Federal Reserve’s major stimulus programmes. The Fed has just two targets – employment and inflation. It has boosted its balance sheet by over $4tn dollars since 2008 to try and meet these targets, and cut interest rates to near-zero. But the policies have clearly failed, given the participation rate decline and that CPI inflation is virtually half the target level at 1.1%. The simple fact is that an extra 13m people would be working today, if the participation rate had remained at 1997′s level. There would then have been no need for the Fed to have created today’s vast debt levels. And the whole world would be in a better state as a result. The UK economy appears to be recovering well from the financial crisis. But appearances can be deceptive. Of course, governments prefer to focus on achievements when they talk about employment. And with major spending cuts due to be announced next week, no doubt ONS felt it was better not to highlight the issue in their summary report. As far as I can tell from a Google search, none of the major media has mentioned this key fact in their reports. However, it is clearly critical for both companies and investors. Consumption is around 2/3rds of the UK economy, and it is the 5th largest economy in the world. The data clearly highlights the fact that, like other major economies, the UK faces a future where there will be a declining number of people in the peak earning and spending Wealth Creator 25 – 50 age group, and a rising number of people in the lower-income and spending 50+ age group. Companies can’t expect to sell products and services to people who can’t afford them. There is therefore an increasingly urgent need for them to develop new business models focused on providing low-cost essentials to the growth area of the over-50s. “The U.S. is expected to experience a birth every 8 seconds and one death every 12 seconds, whilst net international migration is expected to add one person to the U.S. population every 33 seconds. All these factors mean a net gain of one person every 16 seconds to the U.S. population”. These rates are also slightly lower since November, when I last analysed the jobs market. So it is puzzling, to say the least, that most reporting of the US job market currently suggests it is steadily improving . Jobs are certainly being created, but not in sufficient numbers to maintain spending power and thus revive economic growth. How can printing money change these fundamental causes of unemployment? Hopefully next year’s Presidential election will include debate on this critical issue. Otherwise, on current trends, the US will have suffered a further 2% decline in participation rates by 2020, when the 45th President comes to the end of his/her term in 2020. Apparently Friday’s US jobs numbers disappointed the experts. The consensus forecast was that 250k jobs would have been created in March – yet only half the forecast actually appeared. Even more tellingly, hiring estimates for January/February were revised down. Separate data also showed weak growth in wages and spending. None of this was really a surprise, however. There was plenty of evidence that US employment had simply seen a temporary boost from the shale gas bubble. My 8 January post was even headlined “US jobs growth at risk with end of the shale gas advantage“, and was followed a week later by a post titled “US economic recovery at risk as energy bubble bursts“. All the necessary data was easily available in the public domain, if anyone wanted to look. The issue is rather, as I noted back in September, that politicians prefer to ignore these structural problems in the economy. It is much easier to instead simply tweet about the need for more stimulus, and then deliver a sound-bite on the subject for the evening news bulletin. The news is also embarrassing for the US Federal Reserve. They have spent nearly 2 years preparing to celebrate the success of their stimulus policies, since the ‘taper tantrum’ – when then Fed Chairman Ben Bernanke suggested in May 2013 the Fed would soon be able to “normalise” its policies. But now that oil prices are returning to their historical relationship to natural gas, in terms of energy value, the bubble is ending. And unfortunately, it is taking with it the highly paid jobs that the bubble had created. The data also confirms the dramatic swing away from single-family homes towards multi-family apartments. These were one-third of total starts in 2014, around double the average seen between 1989 – 2007, and back to levels last seen around 40 years ago – before the BabyBoomer home boom began. The data is also a sign of the overall decline in home ownership levels, which at 64.4% are back to 1995 levels, when records first began. As with employment, there is also a major divide between ownership rates for the relatively wealthy White population at 72.6%, and those for the poorer Hispanic (45.6%) and Black populations (42.9). As the map from the US Energy Information Agency on the right shows, 3 of these regions have also seen strong growth in oil/shale gas-related activity. It highlights the 7 most prolific areas, responsible for all domestic natural gas production growth, and 95% of all domestic oil production growth, between 2011-2013. Clearly it would need more detailed study to directly link this data with growth in housing starts. But we do know that workers have flocked to these regions in search of jobs. Separate Census data shows that Houston had the 2nd fastest growth in population in 2013 (after New York), and Texas had 3 of the top 10 cities in the list of fastest growing cities. And according to the Census, Texas added more housing units than any other state as a result. But now, the boom is turning to bust, and companies are laying off workers – particularly in labour-intensive areas such as drilling and support services. Major job losses are already underway at Schlumberger and other key employers. We won’t know till March or April just how bad the hit will be to housing. But it seems more than likely it will end the recent recovery in housing starts, taking 2015 levels back below the 1m level again.